It’s time to look at a relatively old courtroom comedy. It’s not “old” like 50s or something like that, but it has been a while since the 90s so I think the relatively part is warranted. It’s definitely a film that has a lot of good humor. The writing holds it back to an extent so it’s not the perfect courtroom movie, but you’ll be entertained from start to finish. It just goes to show how even a case that seems super easy at first can quickly become very complicated. The film starts out with two teenagers on a cross country road trip. They go to a deli to gather supplies and then head out again. Unfortunately one of them stole a can of tuna (accidentally) and then the police show up. The teens are brought into the base, but while they think they were just being booked for tuna, it turns out that they have been framed for murder. Now their only hope is Cousin Vinny who recently got out of law school. The good news is that he claims he can win this case. The bad news is that it’s his first case and he failed the BAR exam 5 times. This could be bad. Right from Vinny’s first appearance you can tell how things are going to play out and I definitely think it works out quite well. He’s the kind of loud, overconfident character that you want in your corner. He may not be particularly good at his occupation and if anything he’s a lot worse than you would suspect, but he always gives the case his all. The stakes may be high, but Vinny won’t get nervous because he doesn’t really take things seriously like that. Even if he loses, at least he’ll be able to make a funny out of it. He tows the line between being a complete comic relief character and someone who is genuinely clueless. Nevertheless, he tows the line quite well. Meanwhile Mona is the main heroine and is always trying to help Vinny out. The problem is that he doesn’t want help as his pride demands that he win this case on his own. It’s definitely a bit of a weak argument on his part and I started to think that the film was leading up to Mona taking over the case. There was a reasonable amount of foreshadowing to it. She does ultimately enter the court room near the end, but not quite in the way that I had guessed. Mona certainly came through when it counted though. Bill and Stan made for good victims as well. They definitely tend to panic a lot though, particularly Stan. He tends to make a bad situation even worse although I don’t blame him for trying to get a public defender. Of course that didn’t end up going very well at all. Apparently some defenders just can’t handle being in a high pressure situation like a court. It did make for a pretty good twist though since it was really unexpected. I wouldn’t have minded seeing more of Bill and Stan, but what we got was pretty sufficient. Then we have the Judge who is definitely a great supporting character. He really wants to have a good court room so you can kind of feel bad for him at different points in the film when it seems like everyone is trying to make a mockery of it. Why can’t they work with the judge instead of against him? He really tries to fry Vinny several times even if it’s to no avail. For the most part he remains impartial despite this and does a good job in his role. I don’t think the film would have been quite as humorous without him. All of these characters were necessary to the final product. As I mentioned the writing is very weak though. Fortunately the censored version cuts out the language but from the sheer amount of word bubbles you can tell that there was quite a bit. These characters definitely have a hard time being professional in the court room. The writing for the humor tends to be solid but the script could use work. It’s very give and take in nature and it still could have been worse of course. At the very least we didn’t quite hit Michael Bay levels of dialogue. It’s a pretty small thing, but I was glad that for once the prison itself didn’t look like a total dump. The prison cell had been cleaned and the place was actually well kept. Usually in films like this the place looks real bad to the point where it is a little overdone. At least this way you feel like Alabama is giving them a pretty fair shake. The film also had a good way of making even the smallest of scenes important like the Grits moment. The scene is so intense they even use the revelation in psych classes to see if you can pick up on small details. I’d still like to try Grits someday. They sound a bit like Cornmeal. 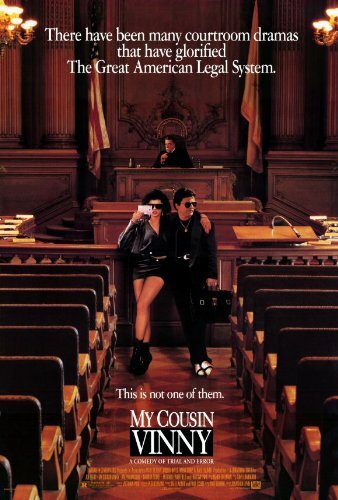 Overall, My Cousin Vinny is a fun film. I gotta give it credit for actually being pretty funny most of the time. It does a good job of taking shots at the courtroom tropes while not overplaying its hand. The film’s length is definitely on point and doesn’t drag on. The pacing is good and the cast of characters are quite memorable. The only real weakness is the very weak script and the film probably takes a little too long in getting Mona involved. Regardless, I’d say that the film will hold up pretty well to repeat viewings which is always important. Find the TV-14 version of this film and check it out. You’ll be glad that you did.